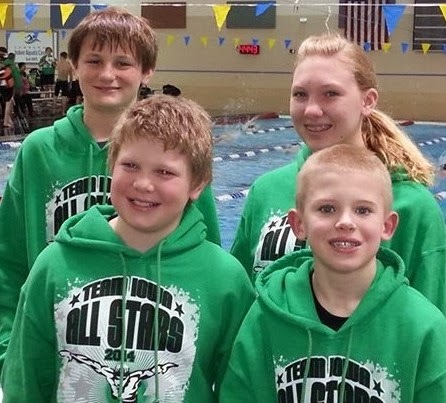 Four Pella Swim Club members were selected to represent Team Iowa at the 30th annual Midwest All-Stars Swim meet. The January 11-12 meet was hosted by the Aquahawks of Lawrence, KS. Team Iowa had 90 swimmers selected to the team from 22 clubs across the state. In early December athletes submitted applications and the five fastest applicants in each event were named to the team. Team Iowa competed against top ranked swimmers from Colorado, Kansas, Missouri, Nebraska, and South Dakota. The local athlete’s representing the 10 and under men included Zachary De Vries and Eli Eekhoff both swimming the 50 & 100 Breaststroke. Caleb Gaylor was selected to swim for the 13-14 year old men in the 100 Butterfly and Alexis De Vries represented the 13 -14 year old women in the 100 breaststroke. This was Caleb and Zach’s second All-Star’s team experience while it was Alexis and Eli’s first time being named to the team. The four athletes swam personal bests in four of six individual events and will build on this experience as they prepare to qualify for the Iowa Swimming State Championships held at the end of February.